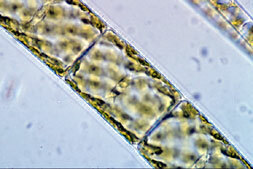 Spirogyra is a large genus (about 400 species) of freshwater green algae found in shallow ponds, ditches and amongst vegetation at the edges of large lakes, generally growing free-floating. 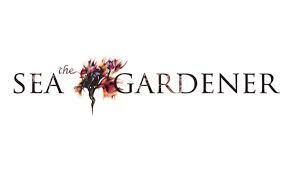 It often grows in short-lived ('ephemeral') ponds that build up during wet weather, and dry up subsquently. 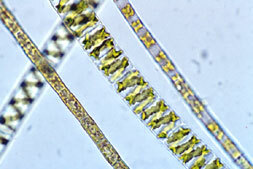 Spirogyra is a great favourite of second-level and third-level course, but is a very unusual alga that strictly speaking does not form any gametes and reproduction takes place entirely within the alga. Cells, 10-100 µm in width, are joined end-to-end in an unbranched, largely unspecialised, stiff filament and are cylindrical with one or two spirally-wound chloroplasts on which many pyrenoids are borne. 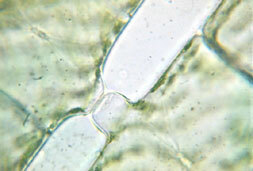 The cell wall is of two layers, the outer of cellulose and the inner of pectin. Filaments can be several centimeters in length. It generally has a rather silky feel and a shiny green colour. Most of the interior of the cell is occupied by a large vacuole (a largely water-filled space) in which the central nucleus is suspended by cytoplasmic strands. 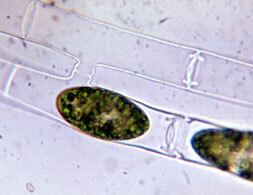 The chloroplasts wind around in the peripheral cytoplasm. Asexual reproduction is by fragmentation only. The strands grow until they break, thus forming more individuals. This only takes place under favourable conditions of moisture, temperature, light and nutirent availability. Sexual reproduction only takes place under adverse conditions, for eample, when the pond dries up. This can be simulated in a dish in the laboratory by allowing a collection dry up gradually over a few days. Two or more filaments come to lie side by side and projections grow out from cells which are in close proximity. There is probably some sort of chemical message released by contiguous filaments. 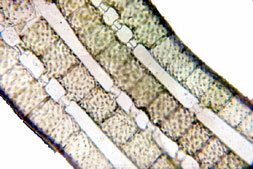 The wall between the projections starts to break down where they meet and cell contents start to shrink by plasmolysis (water loss). The protoplast of one cell moves through the conjugation tube and fuses with the protoplast of the other. This is a form of anisogamous reproduction and is referred to as scalariform conjugation; functionally, the protoplast that moves is a male gamete. Both gametes are non-flagellated. The resulting zygote develops a thick wall which is resistant to adverse conditions and may lie dormant for some time. On germination, the nucleus of the zygote undergoes meiosis; four nuclei are formed (as is usual in meiosis), three degenerate and the resulting uninucleate cell divides to form a haploid filament. 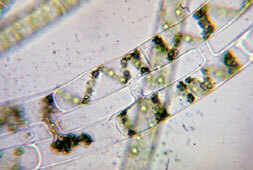 *AlgaeBase currently (3 April 2009) includes 235 species of Spirogyra which is probably a considerable underestimate. There is a full description of the genus on the site. Site © M.D. Guiry 2000 - 2019. Important copyright notice: all text, design and photographs on this site are copyrighted by M.D. Guiry unless otherwise stated and all rights are strictly reserved. Click here for copyright information and contact. Website design: 249 Design Studio. Site maintained by M.D. Guiry (michael.guiry@nuigalway.ie). There have been 8724584 page loads since 1 January 2014 on 22 April 2019.